A Maiden Stakes over 1m 4f 98y on Standard going. Three and four-year-olds take part. The older horses shouldering an age penalty with ten stone on their back. Ed Dunlop had a nice winner a couple of days back with Solajan showing a touch of class. Blushing Red has raced twice for owner The Hon R J Arculli finishing fourth and second respectively. This son of Le Havre cost 100,000E at the yearling sales. He made his debut at Yarmouth back in October when priced 40-1. This chestnut colt drifted markedly in the betting that day over 1m. There is little doubt he needed the run. 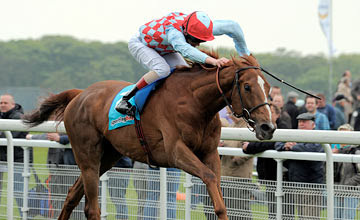 Blushing Red was fancied to go well when making his return in February, stepping up in distance to 1m 1 1/2f. Backed to 6-4f, he kept on well to be denied by less than one length, the first and second nearly six lengths clear of the third. This step up in distance today is a fair test but shouldn't be a problem. The best four-year-old of the lot is Sugarloaf Mountian is lightly raced with four starts, previously trained by Aidan O'Brien. He was purchased for 10,000G now in the ownership of Andy Bell Anna Noble Arnie Flower 1. This son of Fastnet Rock is now trained by Brian Ellison. This gelding wasn't fancied when heading to Newcastle over 1m 2f when 25-1. Then made favourite over course and distance in February when fourth over five lengths behind. Connections mut have been disappointed with that effort and coming back with the hope of better. Tewafeedj is a bay gelding trained by Kevin Ryan. This American-bred son of Mawatheeq was made 33-1 on debut when racing over 1m 1f. He was beaten easily. The second start saw a shorter price at 8-1 when dropping back to 1m when beaten a similar distance looking to appreciate this test of stamina. Highway Man, Ibreeq & Archibelle are best watched. Conclusion: A poor-looking race. Three outsiders have a remote chance so this could be about the three favourites. Tewafeedj hasn't achieved a great deal. This step up in distance may show a touch of desperation. Connections may be better off waiting for a handicap mark. I would take a look at Blushing Red and Sugarloaf Mountain. The latter disappointed last time and needs improvement. Blushing Red gets the nod but the odds are restricted.